Italy - September continues to be a deadly month in the Mediterranean. IOM’s Missing Migrants Project recorded 58 new fatalities at sea since noon Friday (4/9). One was of an infant in Greek waters; two more deaths were reported in the Western Mediterranean near the Straits of Gibraltar, and the remainder between North Africa and Sicily, off the coast of Libya. IOM pegs total deaths of migrants bound for Europe by sea today (8/9) at 2,760, or over 500 more than were recorded on those same routes at this time in 2014. Apparently the smuggler piloting the vessel was not experienced. Survivors said he made a wrong manoeuvre and a wave threw into the water those who were on the bow. Migrants told IOM staff that people on board begged to go back to rescue those floundering, but the smuggler refused. Smugglers are creating more room to carry more migrants by providing them with fewer tanks of fuel – usually positioned at the centre of the craft – with the consequence that these dinghies are overwhelmed and are becoming increasingly less seaworthy. Di Giacomo noted that six landings have taken place since Friday and 2,305 migrants were brought to the Italian ports of Crotone, Vibe Marina, Trapani, Catania, Lampedusa, and Pozzallo. On Monday the Italian navy reported that its salvage operations continue to recover bodies from a shipwreck that occurred on the 18th of April. Italian navy vessels have now recovered 118 bodies found in the fishing boat that foundered off the Libyan coast. The vessels “Turmoil” and “Termite” are said to be bringing 60 newly-recovered corpses to the port of Augusta this week. Off Spain, the body of one Sub-Saharan man was spotted on Saturday after a sailer alerted authorities to two migrants floating on inner tubes some 11 kilometers off the coast of Ceuta. A Guardia Civil vessel found one corpse and is continuing to look for the other. On Sunday, 14 more migrants were intercepted in the Strait of Gibraltar, while another eight were found drifting on a raft. Authorities said a civilian ferry plying the route between Ceuta y Algeciras (Cádiz) rescued six more migrants – five from Chad the other from Gabon – also adrift on a raft. On the Greek island of Lesvos, an unprecedented number of new arrivals have contributed to growing difficulties. 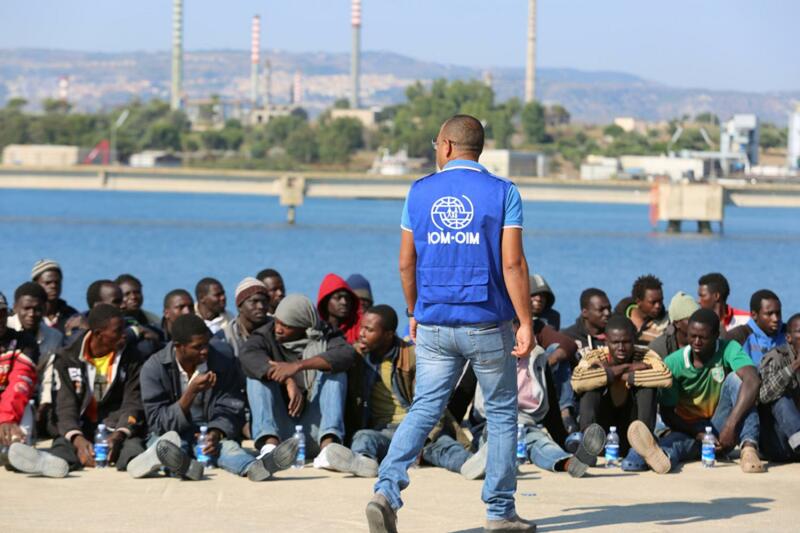 According to IOM staff in the island, over 12,000 migrants reached the island between September 1 and 5. It is estimated that between 10,000 and 15,000 migrants on the island remain unregistered. During the weekend, conflict flared between the migrants and the authorities in the port of Lesvos and as a result registration procedures stopped. This aggravated an already tense situation. Police operating in the Moria processing centre could not provide the migrants, many of whom had walked long distances to be registered, with accurate information. IOM staff on the island noted that the registration process appears disorganized and consequently many Arab-speaking migrants are claiming to be – and are therefore recorded as – Syrian, in order to improve their chances for asylum. A new-born Syrian baby boy was found dead early on Saturday after his parents reached the steep shores of the Greek island of Agathonisi in a boat from Turkey. Due to the weather conditions, the boat crashed onto the rocks and overturned. The survivors were transferred to Agathonisi island, while the infant’s family was moved to Samos for medical treatment. Since the beginning of September, according to the Hellenic Police, over 3,000 migrants have arrived on Kos. Tension between newly arrived migrants and some residents has been rising. IOM's Chief of Mission in Greece, Daniel Esdras, warned that the Islands are facing shortages in capacity and resources needed to adequately handle the arrivals. “This is only the beginning. The facts and figures reported by the authorities cannot describe the situation on the Greek shores," he said. Or Kelly Namia, Tel: +302109919040, +302109912174, Email: knamia@iom.int.